DC's Deathstroke resumes its regular programming this week, two weeks on from a sad, poignant interlude that saw the character facing down real-world problems set -- a change of pace from DC's usual methods -- in a real-world city. "Chicago," published in Deathstroke #11, is a strong contender for the best single comic book DC has published in the post-Rebirth era. An examination of race, guns, crime, and America's culture of violence, it threaded an incredibly small needle with grace, all while remaining a violent, clever, and recognizably Deathstroke story. It's been years since writer Christopher Priest and artist Denys Cowan have worked together regularly -- by Cowan's recollection, that would have been on Steel in the mid-'90s. They also worked together to form Milestone Media, one of the first major attempts at inclusion for creators of color in mainstream American superhero comics. "This is still a great DC comic book if you think about the look and feel we used to bring to Milestone, this is definitely along those lines," Cowan said of last week's Deathstroke. "When I got the chance to draw this, I leaped at it because I believed that Christopher Priest is one of the best writers in comics, easily," Cowan added. "Very few times in my career have I felt like, 'I'm working with a writer who, if I could write, this is the way I would write.' That's how much fun I had doing this." The story, Priest explained, began its life as an inventory story, and then got slotted in when Cowan's schedule suddenly opened up. "I was looking to do an anti-violence story for a fill-in," Preist said. "As a done-in-one, one-off story. And I figured, if you're going to do an anti-violence story at DC, what better place for it than Deathstroke, because only Nixon can go to China. To have credibility, if you're going to do a credible anti-violence story then you want to do it, probably, in your most violent book." Priest said that he landed on the idea that would eventually become "Chicago" after a long weekend of violence in the city in real life. "I thought, 'Well, why not do a story that deals with that?'" Priest explained. "At first, I was just going to make up a city. You know, 'Blackville?' But I decided to make it Chicago, the actual Chicago, and if DC wants insists that I change it to Star City or Central City, or whatever, then let them change it, and they never did. They just went with the program. We kind of moved forward with it." He said that, to their credit, DC never pushed back against the controversial content in the comic, even though there were moments when he expected it. What started as a hypothetical inventory story could have easily become a political football as the publication date got closer, but Priest said that after he held his breath while it had passed through Editor-in-Chief Bob Harras and publishers Jim Lee and Dan DiDio, nobody ever said a word. In fact, the decision to frame the issue around reporter Jack Ryder, the alter-ego of The Creeper, came out of a conversation with DiDio in which Priest was told to feel free to express himself as freely as he wanted to. "I said to Dan, 'I did write my opinion. My opinion is, it's a mess. We're all to blame for this. And the only way to stop it ... The only way to really even begin to solve the problem, is to stop looking for somebody to blame. For US to stop yelling at the cops. And the cops to stop yelling at US, and shooting US, for that matter. And for all these other issues,'" Priest said. That's what brought him to the idea of using a reporter as a point-of-view character. "I thought, 'Well, I want to have as objective a perspective as possible.' Which means that, I'm not taking any position," he said. Priest admitted that he briefly considered the idea of using Lois Lane in the issue, but that given the current status quo in the Superman titles, she's got a bit more baggage than she usually might, and Priest wasn't clear on all of the specifics. Ryder, whom he describes both in conversation and in the issue as an "ex-Jerry Springer type," became the choice, and The Creeper -- who makes only a brief appearance in the story -- came along for the ride. 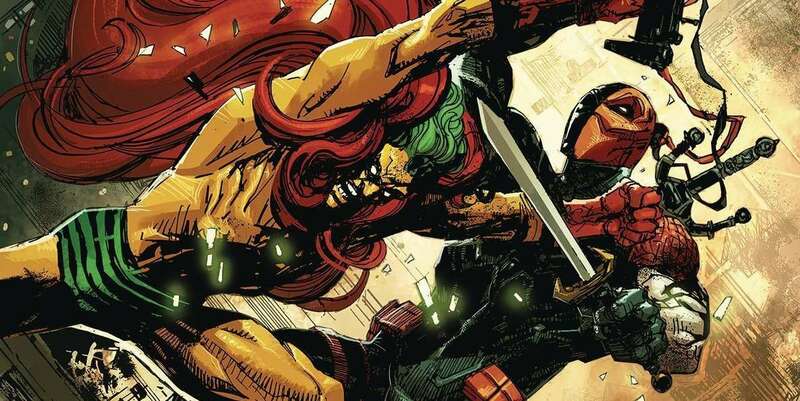 Which was fine for Cowan; he came in expecting to draw a two-fisted, bloody issue featuring Deathstroke and The Creeper, but came out of it thrilled with the more subdued end result. "It gets into the realm of reality when you start dealing with violence and the consequences of violence, and the consequences of gun ownership, and the consequences of what happens in all those circumstances. That took us into a different realm," Cowan explained. "So, now we're talking about a meditation and asking questions about the very nature of this stuff. That's what separated this story for me from the stuff that we normally do in comics. This is much closer to what we would do at Milestone, frankly, than what we usually do in main stream comics. This comic is almost like a milestone prototype in terms of the approach and the talent involved. And, even the way it looks, and the way it feels, and the way it reads. It's much closer to those kinds of elements than normal comics." And as far as that Milestone announcement everyone's waiting for? Well, the pair were pretty tight-lipped, other than to say that they're just as excited as anybody else. "We're all eager to see that," Priest told ComicBook.com. "We've been trying to get that done for a while." You can get Deathstroke #11 ("Chicago") digitally here. Deathstroke #12, the first part of a new storyline, is on sale today. You can pick it up at your local comic shop or get a digital copy here.